15 -1/4 x 19-7/8 x 12-7/16"
Wide-open hopper front provides easy access. 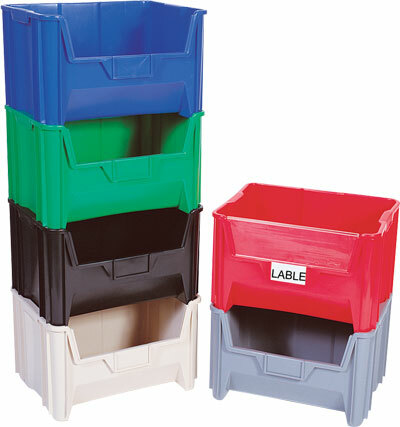 Bins are injection molded from high-density polyethylene. Giant containers are easy to clean, resists rust and corrosion and impervious to most chemicals. Molded in divider slots and optional bin dividers keep items separated and organized. Large label holders allows for quick identification. Extra thick side walls and ribs on side of bin give additional stability when stacking. Increase storage capacity and allow for inspection of parts with optional clear plastic windows. QGH 700 is available in red, gray, blue, green, ivory and black. QGH 600 and QGH 800 are available in gray, blue and red. Please specify color when ordering.